This Tuesday, 5th of March, saw Liverymen and Freemen alike descend on the Guildhall Yard, frying pans and non-slip footwear at the ready. Amidst their number was our very own Jurga Zilinskiene, a proud member of the Worshipful Company of Fruiterers since 2010. Inaugurated back in 2004, the Inter-Livery Pancake race is an annual event hosted and organised by the Worshipful Company of Poulters, which brings together Livery companies in a colourful display where participants’ speed, agility and, most importantly, pancake-flipping skills are put to the ultimate test. London’s Livery companies trace their roots right back to the 12th century when the first guilds were formed by entrepreneurs working in the same craft. 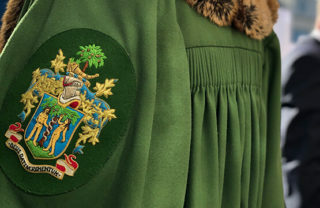 They became known as Livery companies following the introduction of distinctive clothing for each guild, and now all fall within the jurisdiction of the City of London’s Court of Aldermen. Each Livery company remains centred around a clearly defined trade, such as the Poulters, who traditionally regulated the sale of poultry, and the Fruiterers, who concern themselves with the intricacies of the fruit trade. As befits their collaborative origins, each Livery company involved in the day literally brings something to the table. The starting cannon comes from the Gunmakers, while the Clockmakers keep a well-trained eye on the time, the Poulters provide the aprons, the Fruiterers the lemons, and the Cutlers the forks with which to eat the final product. The winner in each category is awarded an engraved copper frying pan, while the best novelty costume receives a silver salver. 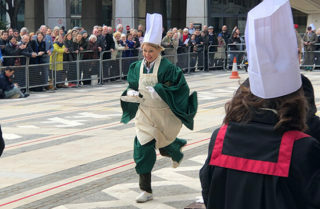 The race itself, which is timed, and includes strict rules relating to placement of feet and the flipping of pancakes, is purported to date back to an original Pancake Race in Olney, in the South-East of England. There are differing opinions as to whether the first race came about as a result of a busy woman multi-tasking on her way to Lenten mass, or bribes of pancakes to the local sexton to ring the church bells sooner and get the holiday started. Either way, the tradition caught on, and the first participant to reach the church and serve their pancake to the bell-ringer was the winner of the day. But of course, it’s not about who wins the race; it’s the taking part that counts. All money raised from the event goes to the Lord Mayor’s Appeal, which helps create a Better City for All by tackling issues relating to diversity, mental health, gender and equal opportunity. And if we happen to have some truly amazing photographs of Jurga into the bargain, we’ll just consider that the icing on the pancake.